From Wien Hauptbahnhof to Praterstern, using any of the S-Bahn or R trains. From Praterstern to VIE airport, using the S7. How much does a single ticket cost for each of these trips? (I've seen prices online between 2.4 EUR and 4.4 EUR.) I don't need any 24-hour, 48-hour or 72-hour pass, Vienna City Card or anything else. I only need these 2 single tickets. As far as I'm aware ticket machines are situated in two locations at the main station: there are two or three down at the underground (with long queues normally) and a lot (about 15) on the main level (the level right below the tracks) of the train station (next to the normal ticket counters). If you come from the tracks down, you more or less pass them when walking to the escalator leading further down. There you should be able to find a machine without waiting. 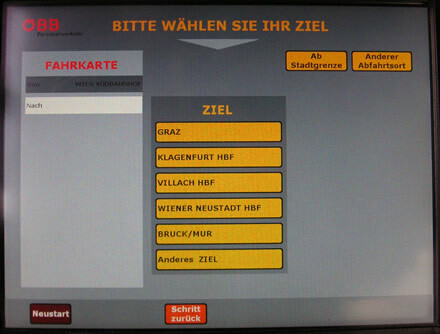 To get from the main station to Praterstern, the ticket you want is called "Einzelfahrt Vollpreis" (something like single trip full fare) für Kernzone Wien and should be accessible on the main screen of the ticket machine. (Of course you will do this in english or another language but I haven't been able to find pictures of the english version of the user interface). 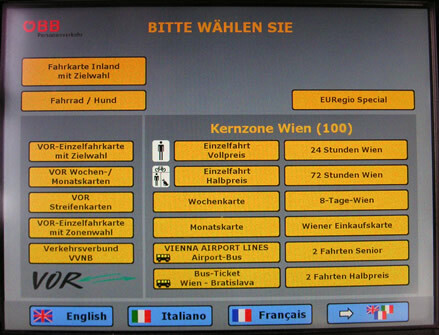 This ticket allows you to make one trip (as long as you stay in Vienna) with as many changes as you want (as long as you don't take breaks or go back in the direction you came from) so is certainly sufficient for you. It costs €2,20. You can then use Schnellbahnen/regional trains and also the subway (U1 in direction Leopoldau) to get to Praterstern. The subway is a little bit faster and probably easier to navigate. Don't forget to validate the ticket (you can do this before entering the subway at the blue validators or maybe already at the ticket machine). To get from Praterstern to the airport, you want a "Fahrkarte Inland mit Zielwahl" (domestic ticket with selection of destination). If you buy it at Praterstern you can just enter "Flughafen Wien" and select from the suggestions. 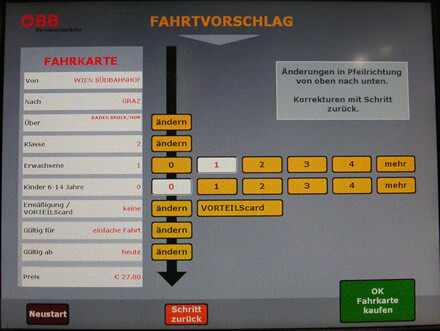 If you buy it at the main station, you should first select "Anderer Abfahrtsort" (different point of departure) (and if you buy it a few days in advance you also have to change the date of validity later on: this is shown in the picture below in the row starting with "gültig ab" (valid from)) and then continue to select your destination. This ticket will cost you €3,90. To check the prices of (and buy) the tickets, you can also use oebb.at. If you want to buy the tickets there, again make sure to select the correct time of departure. Using Mastercard to buy the tickets shouldn't be problem at all. It might even work if it's a chip+signature card (though I can't guarantee that). Not the answer you're looking for? Browse other questions tagged tickets vienna or ask your own question. How do you use a Budapest 5/30 travelcard?